Cu Chi Tunnels is famously known as an underground network built by Viet Cong soldier to serve secret operations against American army. It’s even recognized as one of 12 most admirable underground constructions in the world by CNN and becomes a must see attractions towards both local and foreign visitors. Through a Cu Chi Tunnels half day tour, let take a closer look inside what’s it like to live in such a complicated yet comprehensive network during the war time. 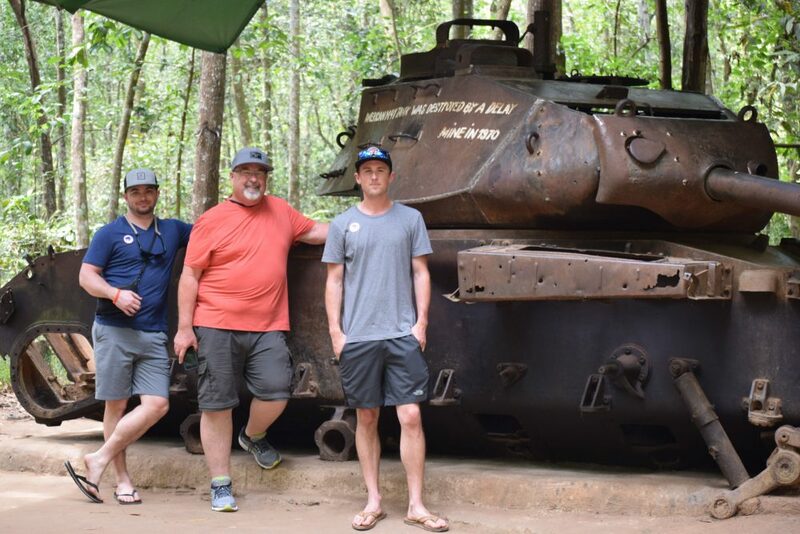 Located about 70km away from the city centre, stretching all the way to Western North, Cu Chi Tunnels, for years, is known as a favourite attraction towards travellers, regardless age, gender, foreigners or locals, especially those who are interested in exploring further about the war and history in general. The total length of the tunnel network is approximately 200km, which was designed highly logically, complicatedly with accurate scientific calculations. This underground network complex is stayed at Cu Chi Ward of Ho Chi Minh City. Today, it was divided into two main tunnels system, which are Ben Dinh and Ben Duoc. 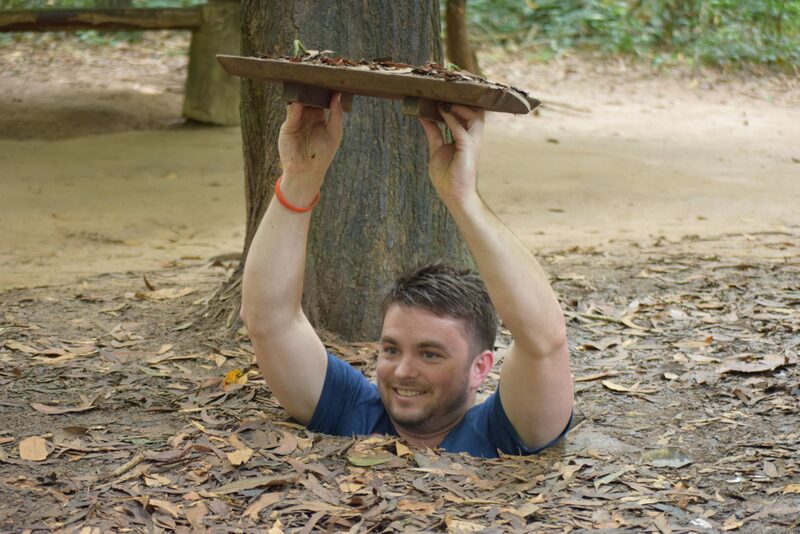 During the war time, Cu Chi Tunnels was the basement that covered and lead the operations of Viet Cong and guerrilla forces. 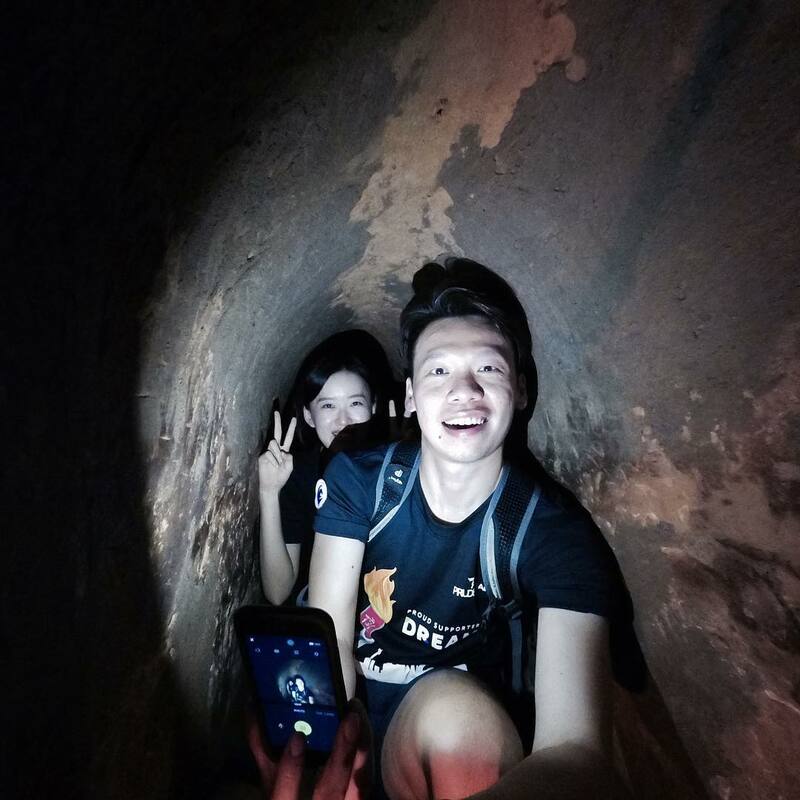 Cu Chi Tunnels is a favourite and must see attraction to major of travelers when visiting Ho Chi Minh City. The idea of building such a massive network was shaped during the time between 1946 – 1948, during an defensive operation of Southern army forces. To finish the construction, it took Cu Chi people roughly 20 years. 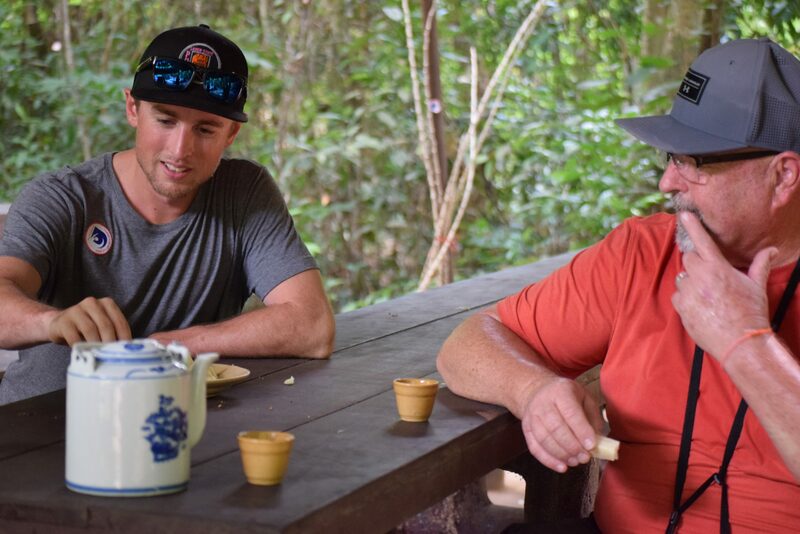 At first, each hamlet built their own tunnels, until the intensity of the campaign was raised to a higher level, the residents of 6 North Cu Chi united to connect theirs into such a massive and comprehensive tunnel system as we see today. It’s not simply a place to hide people from the bombing attacks but where the Viet Cong soldiers stored their weapons, it’s also a hospital and a hamlet to those who fought. The underground network is divided into 3 layers: the first layer is 3m deep from the surface, the second layer is 6m deep down into the ground, and the final layer total depth is 12m. Each layer was used to serve different functions, for instance, the deepest level aka the safest, was used as a hospital, weapon storage as well as meeting rooms to discuss secret operations. The entire tunnels were dug on the soil that mixed with laterite, hence, the downthrow and damages were minimized. The lanes inside the tunnels are tiny and low, which made people have to lower their heads or crawl in order to get through. To a Westerner, whose body size is averagely larger than Vietnamese, crawling through the tunnels is such a real, unimaginable challenge yet it gives a living in war vibe and back into the war time. Crawling through the tunnels is fun yet challenging. In order to jump into the tunnels, you first must find out the gates which are secretly covered to avoid being spotted by the enemy, usually by leaves, tree branches or soil. Today, as visiting the tunnels, you can still easily spot the small piles of dried leaves or termites, which are also methods of covering the gate. And everybody has to admit that those are very a safe and effective way of disguise. Another huge function of these piles is to provide oxygen to people lived underground, acting like an air conditioning system. In addition, it provided the factor of surprise in the attacking campaigns where the Viet Cong soldiers came from out of nowhere or helped them heard what the enemy discussed when walking above. Try to fit yourself into the tiny holes is incredibly hard. Besides admiring an unique, highly complicated military construction, visitors should not miss the chance to experience beforehand the life of Viet Cong soldier as the lived underground. Hence, you can gain further insights about the brutality, harshness of the war as well as the bravery and intelligence of people who lived down there. You will be amazed how people can built such a comprehensive network with hospital, kitchen, meeting rooms, warehouse so that the operations could not be interrupted and the communication went through so smooth. Crawling through the tunnels and observing war remnants are put on display, with the detailed explanation of the tour guide, you may feel like you’re brought back to the war time. 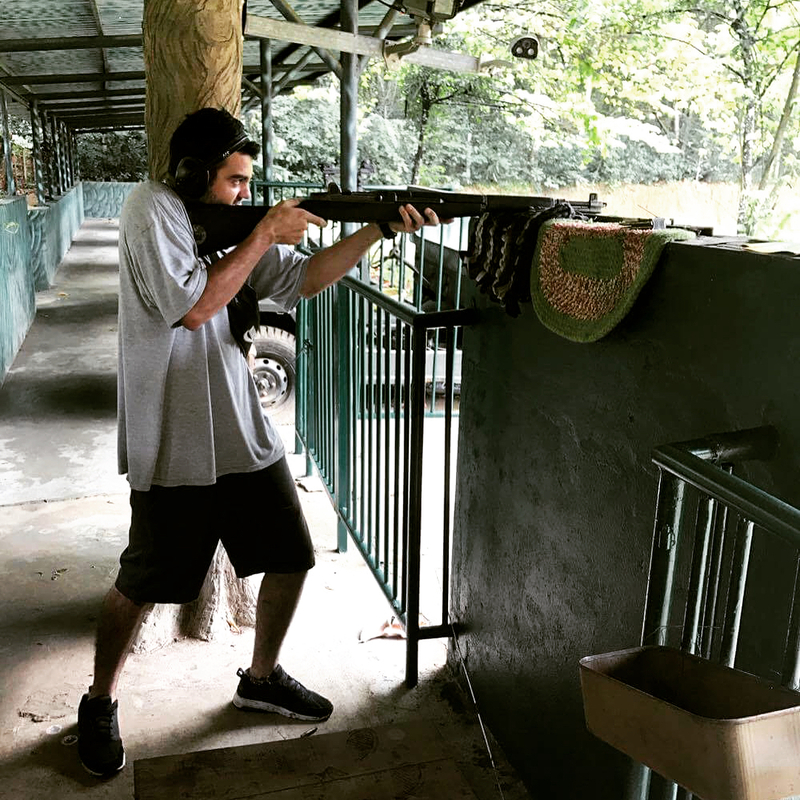 Also, you will be shooting at the shooting range with real bullets and AK47, the guns that Vietnamese soldiers used during the war with America, a Russian made weapon and said to be the gun with best quality at that time. You can also test your shooting skill with short gun or M16, the guns used by American soldiers. The shooting will surely gives you an adrenaline rush and push your excitement to climax. Adventurous travelers should not skip the chance to shoot with real guns. By bus: From the bus station next to Ben Thanh market, jump on Bus 13 or 94 to Cu Chi bus station, catch the Bus 79 to Ben Duoc. By taxi: with approximately 1,5 hours of moving, you’ll be charge about 500,000 – 600,000vnd/turn. Uber or Grab is an cheaper alternative. Car: follow a group tour or private tour to travel on the private car. Shooting range: the most favourite activity by visitors, you must buy pullets in order to shoot, minimum 10 pieces. The price of each bullet is 5,000vnd. There will be a instructor to train you on how to use the guns and shoot. Swimming pool: 15 minutes from the tunnels by walking, jumping into the water is so fresh and enjoyable, especially when you travel on a hot day. Trung An fruit garden: where you can pick fruits and eat right in the garden while paying at a very affordable costs. Must eat foods: Cu Chi beef, Cu Chi grilled rice paper, Cu Chi cassava, boiled sweet potato, steamed or grilled corn, sugarcane and coconut. 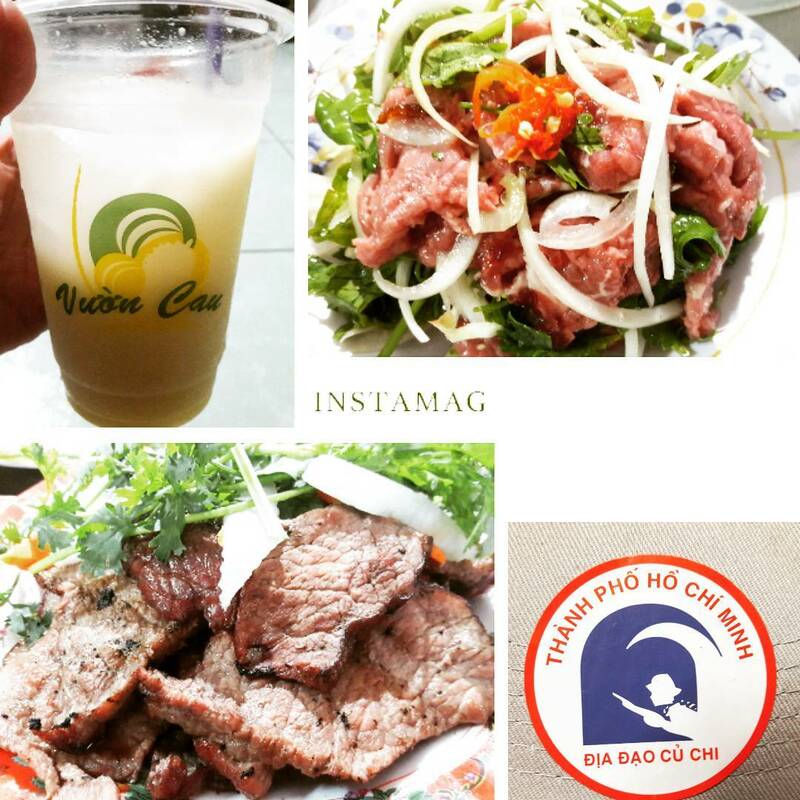 Treat yourself and recover after a long visit with best of Cu Chi specialties. Our tasty Saigon food tour: Too full to move!